I think juicing can help everyone become their most healthy selves, whether you’re losing weight or just want to feel better juicing can help. I’ve gathered together my favourite juicers that you can buy for under $100. And just because they’re cheap doesn’t mean their bad, these can all still make you an excellent glass of juice in the morning. With that said, let’s get stuck in and see what a good cheap juicer needs before I reveal my favourites. There are three main types of juicer you’ll come across as you shop, and it’s important to know the differences. Because you don’t want to set out to buy a citrus press and come away with something designed for leafy greens! This is exactly what it says a press that squeezes citrus fruits for you. So you can use it to make fresh orange juice in the morning. It doesn’t have any sort of blade or gears involved, just a press to squeeze out citrus fruits. You definitely shouldn’t be spending over $100 on one of these but I’ve included a cheap citrus press further down all the same. These work more like blenders and have spinning blades at the bottom which shred up whatever you put in and let the juice run out underneath. The normal function of a cheap juicer, masticating ones (which I’ll get to next) are normally a bit more expensive. Where they excel is making a quick glass of juice though, the fast-spinning blades make short work of whatever you put in and they’re normally nice and easy to clean. Great for beginner juicers who are wanting to dip their toe into the world of juicing. My preferred type of juicer, these work with two big rotating gears that your fruits and veg get fed through squeezing every last drop of juicy goodness out of them. Normally a bit more expensive but I have found one cheap one that’s under $100 that I’ve included in the list. Masticating juicers give you more juice from the vegetables you put in compared to centrifugal ones and it stays cooler so all the enzymes inside get kept intact. Just a couple of other things you should keep in mind when you’re shopping for a cheap juicer. Eventually a self-cleaning juicer will be invented and when it is you can guarantee I’ll be first in line to get one. But until then we are stuck with having to clean them ourselves. And so let’s make our lives a little easier and keep to juicers that are easy to clean. They normally say this on the box somewhere but generally the fewer parts it has the easier it will be to clean. Just because the price is low doesn’t mean we want to sacrifice health quality so always look for some sort of BPA free announcement on the packaging or descriptions. BPA’s are a chemical used in certain cheaper plastics and if it’s in contact with food for prolonged periods of time it can seep into the food and into you! Yuck! So let’s just avoid that and stick with BPA free. Make sure the pulp has somewhere to go when it’s gone through the juicer, you don’t want all the waste pulp going all over the counter! I’ve not seen many juicers come without a waste collection bucket of some kind but just make sure it does, in fact, have one. There just one thing you have to look out for in a budget juice. If the price is too good to be true it probably isn’t. A decent juicer will cost at least $40-50 (unless it’s on sale) any cheaper than that and it will just be useless. 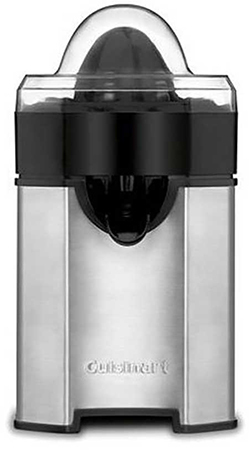 Not for a citrus press, they’ll always be less than $50, I’m talking about proper centrifugal or masticating juicers. I’ve reviewed my 5 favourite budget-friendly juicers and the best part? They’re all available on Amazon so you can click through and order yours today. A masticating juicer for under $100! Hallelujah! 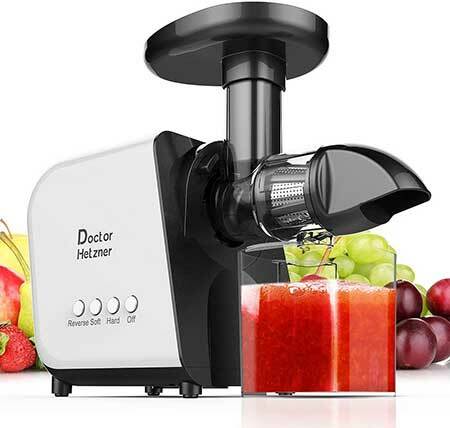 As I said earlier masticating juicers make more juice from the same amount of fruit and the yield of the Doctor Hetzner is up to scratch. A lot of juice comes out, no pulp and not heated up. The key with this is to cut up the veggies first because it won’t handle big whole vegetables it will jam, but if that does happen and it jams it has a reverse function that you can reverse the motor to get the jam out which is pretty cool. It’s capable of juicing pretty much anything you could want, it handles fruit easily and even harder root vegetables like carrots, but it can also take leafy greens as well if you’re wanting to make yourself some green juice. It also comes apart nice and easily so you can clean it without much hassle, plus as long as you remember to put the waste bin in place you can use it mess free. 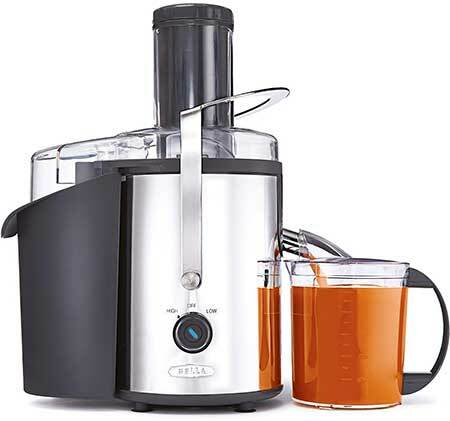 A great budget masticating juicer perfect for the beginner and experienced juicer alike. It’s pretty damn noisy when you use it, and because it’s cheap and made of plastic it has a tendency to start walking across the counter. Stick a tea towel underneath to stop it walking, keep all the doors closed and you still get a glass of juice at the end of it. It doesn’t come with the glass to catch the juice either so you have to have one that fits (most people do) but it does have that nice big collector for the waste on the back. And the whole thing is BPA free and relatively easy to clean so you could definitely do a lot worse, and it’s almost half the price of the Masticating juicer above. To be fully clear, this juicer is designed to juice citrus fruits (oranges, lemons, grapefruit), and nothing else. I just don’t want you buying this thinking it’s something it isn’t! What’s cool about this one in particular, is that it has adjustable pulp settings, so you can change how much pulp comes out! So whether you like it smooth or pulps you can get what you want. It’s also got an extra spin feature so it finishes juicing slows down but then speeds up again for a final spin to get every last drop out. Noise wise it’s definitely in the middle, there are definitely louder citrus juicers but there are also definitely quieter ones. 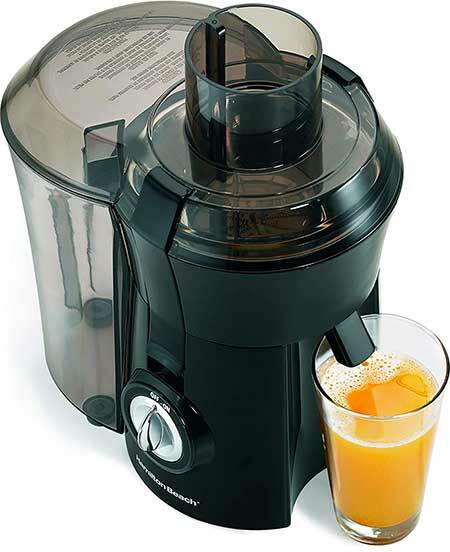 But if orange juice is your go-to then this is the juicer for you. It is with a heavy heart I have to be the one to say it…. This isn’t the easiest to clean. It’s not hard to clean but it certainly isn’t the easiest because it has quite a lot of parts you have to deal with while cleaning with it, but when you’re buying a cheap juicer you can’t have everything. But what it does have is two different speed settings, 12,000 rpm and 14,000 rpm, which is good for maximising the amount of juice you get from it when you use it. You use the high-speed setting for dealing with hard produce, stuff like carrot and kale stems, and then the lower setting for softer fruits. Like anything though you’ll start using it yourself and get to grips with how you like to use it.